It feels appropriate to start this with "I write to you from my Maths revision cell" or simply "RUN AND SAVE YOURSELF!" English was yesterday. Maths is tomorrow. Seriously, revising Maths is so hard. What am I doing?? Is any of this going in?? Am I even going to pass?? WHY WOULD ANYONE USE A TRIG EQUATION EVER?? Anyway, I am taking a brief break before the heavy hand of calculus descends once more to bring you a couple of card tutorials. (I know it's not Tuesday, by the way. But we can roll with it.) These both have a winter colour scheme, in the spirit of holding on to any happiness in this bleak month of coldness (and exams). I found this on Pinterest a long time ago. It is very pretty but I decided to make my own using a more festive colour scheme, for my mum's birthday on New Year's Day. Here you have it. 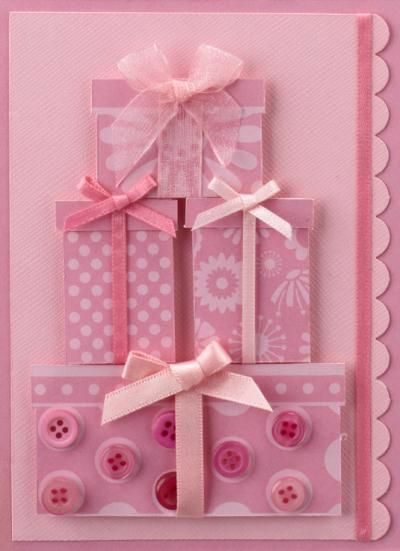 This card involves patterned paper and ribbon and a lot of glue - I used Pritt stick for the papers, UHU for the ribbon lines and a hot glue gun for sticking the bows down. Another card found on Pinterest. This is very classy but I wanted to make one that felt a bit more cheery. 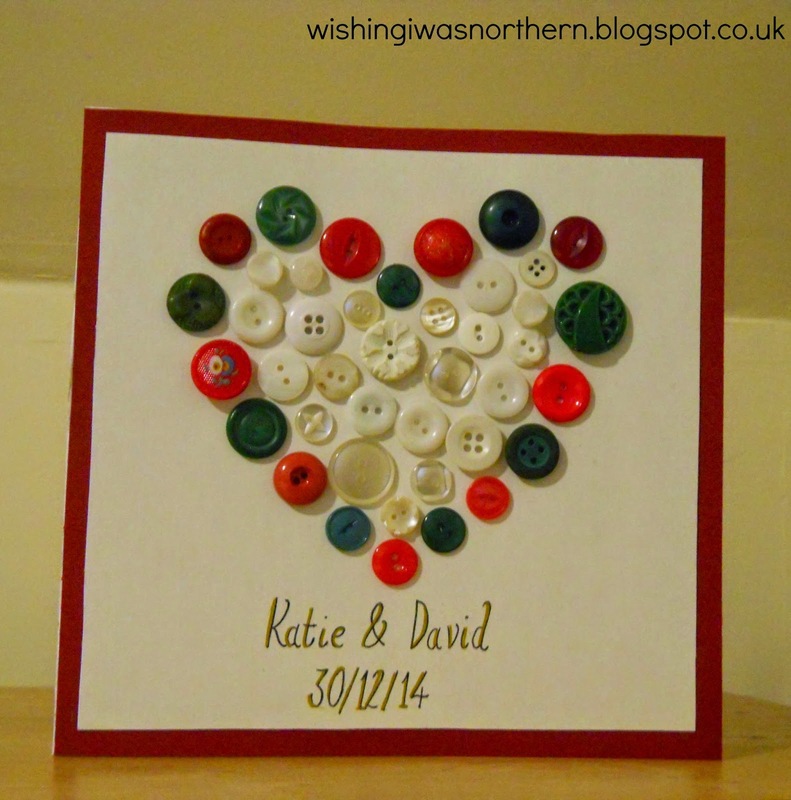 As you can see, I added the green and red border of buttons and the couple's names before sticking onto a piece of dark red card. Note that the white part is also strong card; I didn't want to take any chances because you need strong card for buttons. Again, I used my hot glue gun to stick them down. Have you been engaged in any post-Christmas crafting? What have you made? Pictures, lurking anywhere on the Internet? Also, does anyone have exams?? UGH. Do you see?? I got first comment! I WON. I WON IT ALL. Tbh I like your version of that first card waaaaaay better than the actual version so KUDOS, LAD, KUDOS. You are highly talented sticking- and cutting-wise. Very talented. Yes because I am a famous blogger and people are always fighting for first comment. SO YOU WON. THANKS PAL. It involves rulers (which I know are not your friends). AND TO YOU glug maths glug glug glug <-- the noise of me disappearing down the plughole. This is cool! I was looking for a card for a friend but I couldn't find one that I liked. I figured I could make one for her. So this gives me some neat ideas! I will definitely have to try something like this. Thanks! I spend a *lot* of time on Pinterest finding card ideas. If you do try either of these, send me a picture! Ooh, those cards are so pretty! See, some people insist on handmade cards, but I'm all like, "Why make a card, when I probably won't make a very good one anyway, when there are pretty cards like these out there?" Thanks! Haha, well, this may be the case ... however there are some very simple handmade cards you can make, for example this second one! Thanks Dian! And thank you, you're very kind; the exams went fine, fortunately! PS sorry for this horribly late reply, I have been internet-less for a month but I will hopefully be posting soon! This is incredibly belated, but GOOD LUCK FOR YOU MATHS EXAM! And I know, ~right~?? I want to be a travel thingy person when I'm older, am I really ever going to need to work out the value of x?? And I only have a Spanish exam coming up, which I've only have four days to prepare for and hundreds upon hundreds of words to learn because I actually have to say my dialogue out loud in front of my Spanish teacher.. great. AND A VERY VERY VERY BELATED NEW YEAR AND STUFF!! This is even more incredibly belated but THANKS THANKS THANKS I PASSED!!! Thanks! Haha I've never really thought about selling, if people actually wanted them I don't know if I'd have time to make them. I dunno, I could look into an Etsy shop though ... maybe? I hope it went well! I'm sure it did! THANKS! Wow it is the 11th of February but yeah happy new year to you too!! I've had no internet for a month, hence this very very very late comment, you feel? Exams EEEEWWW!! I just had them last week, and they were awful. Thankfully I passed all of mine with A's (or 96-100%) but the studying was killer. I know how you feel about math.... math is the worst to study for, but hopefully you did well on it! Cool crafts by the way. 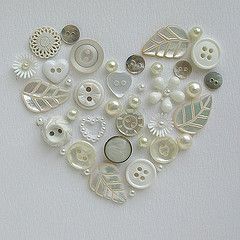 You're so talented in the crafty department! EEEWWW indeed! Wow well done! Very impressive! The studying is awful, I agree >.< I did get an A in Maths so it was worth it! Thanks! Sorry for this disgustingly late reply, however: internet issues, I'm afraid (only back online yesterday, after a month of none!). I felt the same way about my math exams back when I was in school. Usually, everything would be completely different on the tests than anything we did in class, so that panic was very real. Yes, this is my panic also! Thanks so much! I wanted something a bit Christmassy - though it feels weird to say that now, on February 11th! Sorry for this very late reply; I've been without internet, sad to say!